"Monkey-Biznizz" image. Courtesy of the Center for Popular Music, Middle Tennessee State University. Used with permission. Volunteer Voices, Tennessee's statewide digitization program, was created in 2003 under the leadership of Tenn-Share, an organization that promotes resource sharing among libraries. In 2005, Volunteer Voices received a three-year grant from the Institute of Museum and Library Services (IMLS) to build a digital collection with the theme "The Growth of Democracy in Tennessee." Three digitization content specialists worked with approximately 100 contributing institutions across the state to select and scan materials and create records for more than 10,000 digital images. In addition, grant and matching funds were provided for digitization training, workshops for K-12 teachers, and publicity materials. Examples of collections with national significance illustrate the value of aggregating content from different institutions into a single database. 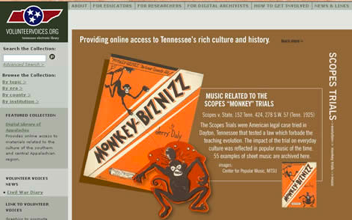 Scopes trial materials include sheet music from Middle Tennessee State University's Center for Popular Music, as well as photographs and documents from Bryan College, the Tennessee State Library and Archives, and the University of Tennessee. Civil rights items include photos and documents from the 1968 Sanitation Workers Strike Collection (University of Memphis Special Collections), the Memphis Civil Rights Photograph Collection (Memphis Public Library), and photographs related to the desegregation of Clinton High School (C. M. McClung Historical Collection). One goal of the grant was to target smaller institutions, many of which lack the funding and technical support to digitize materials on their own. Collections largely unknown before the grant period, such as Stewart County Public Library's photos of students at rural schools in the 1930s and 1940s, now have a worldwide audience. Sumner County Archives, one of 20 county archives participating in the project, contributed petitions for the emancipation of slaves. 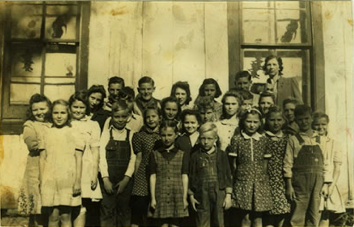 Teacher and students of Upper Long Creek School, Stewart County, Tennessee, 1942. Courtesy of Stewart County Public Library, Dover, Tennessee. Used with permission. Project staff also made a special effort to include museums, once again focusing on small institutions. Four training sessions were held with museum and library personnel interested in learning more about the digitization process and metadata creation. Examples of museum items in Volunteer Voices include musical instruments from the Museum of Appalachia, portraits and documents from Travellers Rest Plantation and Museum, and photos of mill workers from the Englewood Textile Museum. The MODS metadata records in Volunteer Voices allow for exceptional search and organization capabilities. Melanie Feltner-Reichert (UT) and Cathi Carmack (TSLA) designed the metadata schema with input and approval from the advisory board. The schema elements not only provide extensive detail, such as repository, finding aid, and end-user comments, but also allow end users and developers to manipulate data for their own purposes. The records contain county-level information that can be geo-coded and linked with historical information concerning, for example, the Civil War, allowing the end-user to retrieve not only maps and images of battles, but also correspondence between significant players in the conflict. 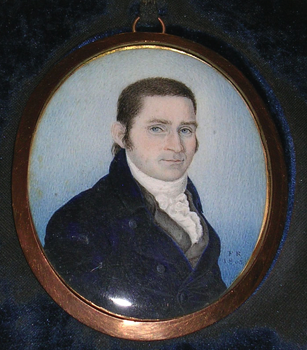 Miniature portrait of Judge John Overton, 1804. Courtesy of Travellers Rest Plantation and Museum, Nashville, Tennessee. Used with permission. The most unique aspect of Volunteer Voices is its commitment and focus on education and integration with the Tennessee Department of Education curriculum. The grant included a full time Education Coordinator to work directly with schools and project staff from the beginning. Funds were allocated for travel throughout the state providing training and workshops to K-12 teachers in both public and private schools. In addition, teachers received a stipend and reference materials for their classroom, and schools received money for substitute teachers. Throughout the grant period, the Education Coordinator visited many schools and school districts, and offered training opportunities ranging from one-hour presentations to full day workshops. One workshop attendee synthesized the experience by writing: "Volunteer Voices opened up a whole new source to help make my teaching more interactive." The Education Coordinator also worked directly with the Content Specialists to define areas that needed development, especially where teachers found it difficult to locate primary source materials. The IMLS grant has provided the groundwork for building a sustainable digitization program in Tennessee. Institutions that did not participate in the grant are asking how they can contribute to Volunteer Voices. Knowledge of digitization techniques and standards is better distributed across the state, and teachers include the collection as a regular part of the curriculum. The challenge now is to build upon the infrastructure, energy, and collaborative spirit created by the grant to transform this major digitization project into a vibrant digitization program. To view these collections, see http://volunteervoices.org/.